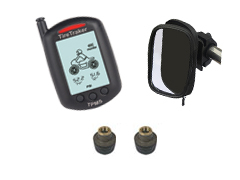 The TireTraker™ TT-700 is a full time wireless electronic tire pressure monitoring system (TPMS) designed for Motorcycles to monitor and display tire pressures from 0 psi up to 72.5 psi, and also to monitor tire temperatures from 14°F to 185°F. It is capable of displaying current tire pressures and temperatures as you cruise down the road. The TT-700 consists of two basic components: Tire Sensors (Transmitters), which screw onto the wheel valve stems, and a Monitor (Receiver) located near the vehicle operator. Sensors transmit a coded RF signal and alert if pressure drops, pressure increases or temperature increases. The Monitor displays each tire’s pressure and temperature per tire position and will display an audible and visual alert if pressure or temperature changes.